On April 11th, VTA will make several service changes along 7 lines along with minor changes to 12 lines, with many coinciding with CalTrain's recent service changes. Until then, though, connecting services between the two transit agencies will be quite random. If you transfer to VTA from CalTrain, we recommend you catch an earlier train to ensure you can reach your destination on time until April 11th. VTA Downtown Customer Service Center, located at 55A. West Santa Clara Street, San Jose. VTA Marketing and Customer Service, located at 3331 N. First Street at River Oaks, San Jose. Email VTA at [email protected] to have the new schedules sent to you. For more details, go to vta.org. The First Bus Rapid Transit Line is Coming to the East Bay! The AC Transit Board of Directors has given O.C. Jones & Sons the official $108 million construction contract to build & construct the East Bay's first bus rapid transit (BRT) line! 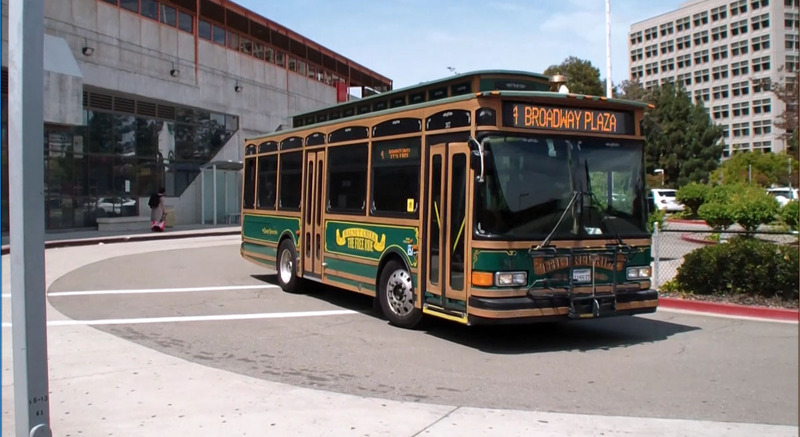 AC Transit's future sophisticated BRT lines will travel between 20th Street & Broadway, in Downtown Oakland, to San Leandro BART along International Boulevard. The BRT system will replace AC Transit's existing Routes 1 and 1R, starting at 20h Street & Broadway. Unique transit signal technology will allow buses to partially control traffic lights, allowing a bus to pass through before turning red. New, ultra-low emission 60-foot articulated buses manufactured locally by New Flyer will run on the BRT line. Each bus will have five doors to speed up the boarding and exiting process. AC Transit's BRT system will be frequent as well - every 5 minutes during rush hours and every 10 minutes during off-peak times. Raised platform stops will be placed approximately every 1/3 of a mile. The system will span 9.5 miles, with a majority of the line on International Boulevard and East 14th Street, in Oakland and San Leandro. AC Transit's new BRT buses will also come with some innovative features - Interior bike racks will be included and new wheelchair tie-down systems will reduce dwell time while securing a person in a wheelchair. The BRT line will make direct connections with 46 of AC Transit's bus lines, five BART stations, and Oakland International via a transfer to Route 73. 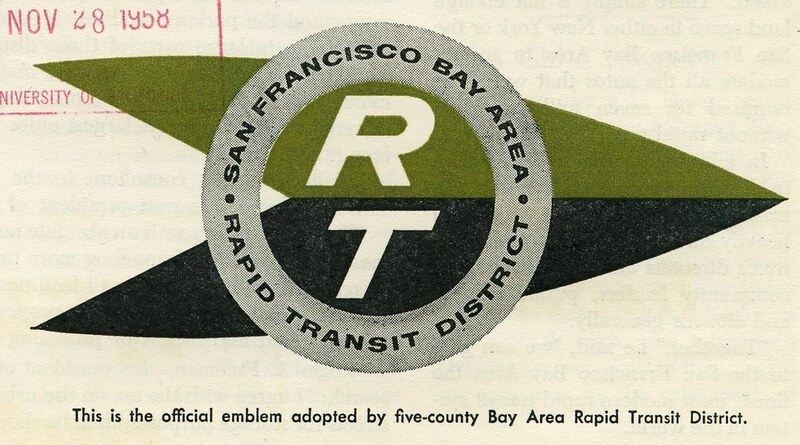 To learn more about AC Transit's innovative BRT system, visit http://brt.actransit.org/. For more info, visit actransit.org. San Francisco, with the help of the SFMTA Bike Parking Program, has turned what used to be car parking into a gorgeous bike corral area. When the SFMTA Bike Parking Program was just toying with the idea of converting a parking spot to a mural in asphalt Michael Krouse, owner of Madrone Art Bar, took the unique opportunity to spruce up the outside of his business. The bike parking area sits at Fell & Divisadero, and is one of the many examples of San Francisco's progress as an increasingly bike-friendly city. Last year alone, the SFMTA installed over 800 new bike racks around the city, bringing the total number to around 5,000. These racks park over 10,000 bikes a year in 3,000 different locations. 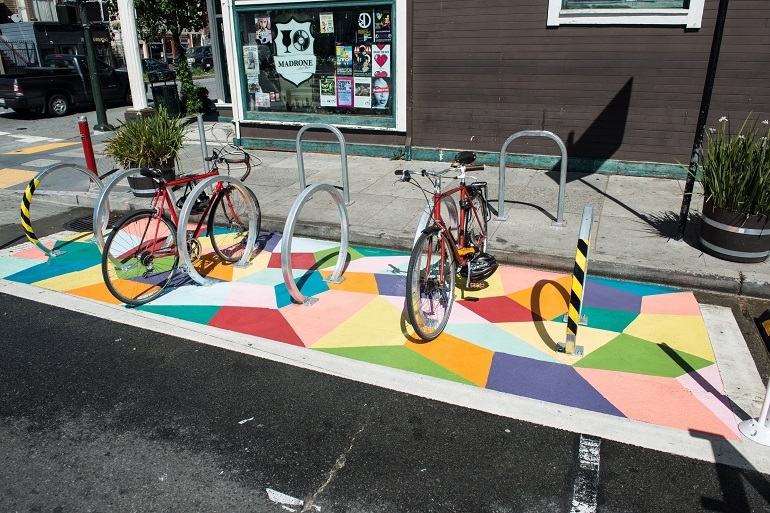 For more information, visit https://www.sfmta.com/about-sfmta/blog/our-newest-bike-corral-work-art. After a few weeks of off-and-on, to no, train service between Pittsburg/Bay Point and North Concord BART Stations, normal service has finally resumed, and BART is back on track. That doesn't mean all problems are fixed, however, as BART still has no idea what is causing the huge power surges on the tracks and taking BART's 'C' cars out of service. To actually provide normal service to Bay Point once again, BART has moved its 'C' cars to its four other lines and is currently only operating 'A' and 'B' cars on the Yellow Line, which are less susceptible to the mysterious electrical spike. Will it be like this for a while? Well, until BART can track down its trackage problem between these two stations, this unorthodox 'system' will likely continue. 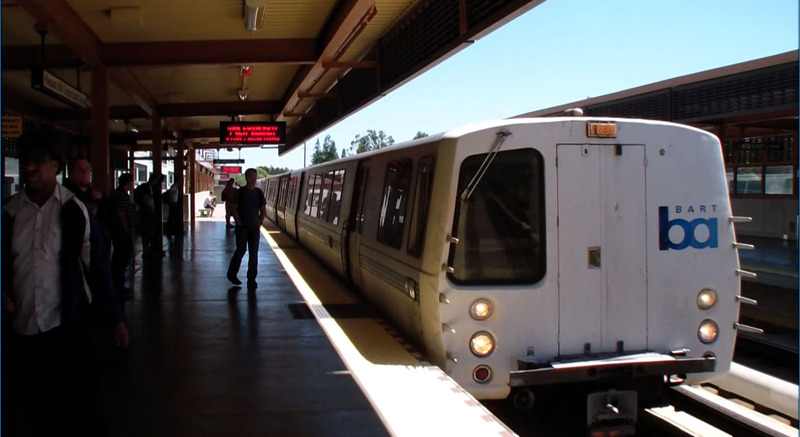 BART claims the Fleet of the Future will not be susceptible to this electrical spike issue, but the first cars are not expected to roll out until the end of 2016. For now, BART remains in disrepair, disregarded for years by funding, and is now scrambling to solve its many inherent problems until its new fleet arrives. Yesterday, March 21st, partial service returned between BART's North Concord and Pittsburg/Bay Point Stations during both rush hours. A shuttle train now runs during rush hours every 15 minutes between the two stations, but the bus bridge between N. Concord and Bay Point still remains during off-peak hours. Until BART can fix the issue, this unorthodox system will most likely continue, a huge obstacle for Bay Area commuters to tackle every day. BART is getting worse, if you can believe it. Ever since the end of February 2016, the aging transit agency has experienced extreme electrical issues in the east-bound Transbay Tube direction and between North Concord and Pittsburg/Bay Point Stations. The problem emerged towards the end of February in the Transbay Tube when certain BART cars traveling in the east-bound direction experienced a major voltage spike. Relevant to C cars only, some cars were experiencing spikes in electricity that were up to 2x what BART expects, damaging a car's propulsion system and taking them out of service. 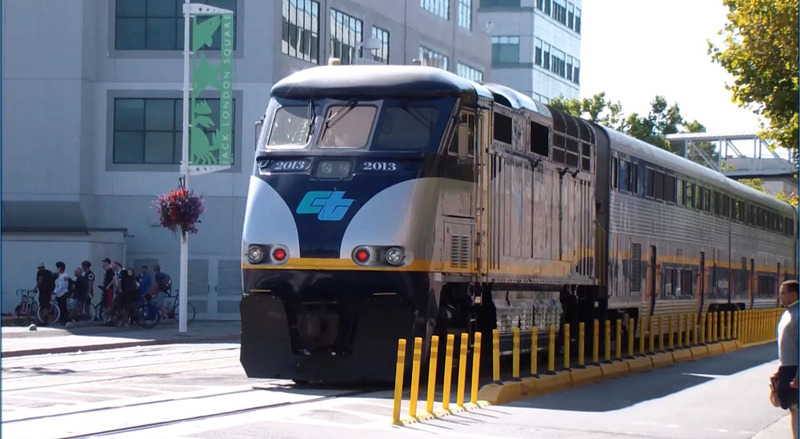 The problem emerged again this month when trains running between Pittsburg/Bay Point and North Concord/Martinez Stations experienced a similar voltage spike and were taken out of service. Currently, 58 cars have been damaged by this mysterious spike in power. BART does not know where this mysterious voltage spike is coming from - it is possibly emerging from two power generators BART workers replaced a few months ago, but we can only guess for now. To combat the power surge, BART shut down all service between North Concord and Bay Point until the problem can be traced down and fixed. BART has set up a bus bridge between the two stations, but this is hardly a justifiable solution for very long. Because of the power surges, BART does not have the typical fleet it usually does - with dozens of cars in BART's maintenance facility from the power spikes, trains have become shorter and more crowded. It may take months to find and repair the power surges on BART's System, which only adds to smaller, more crowded trains. So is there any hope for a better BART? The answer is, soon. BART's Fleet of the Future is almost here - The first cars are expected to begin revenue service next year. But that's the problem - that's next year, 2017, and the Bay Area needs relief now. We have to wait a little longer for help, but that's help which should've come ten years ago. For years, hardly any funding was put forward to help BART, and we're realizing a bit too late the mess of a system we've created. Clipper is now officially expanding to transit agencies you've never heard of, which is a fantastic thing, as it points to a Bay Area that's slightly closer to a universal fare payment method. 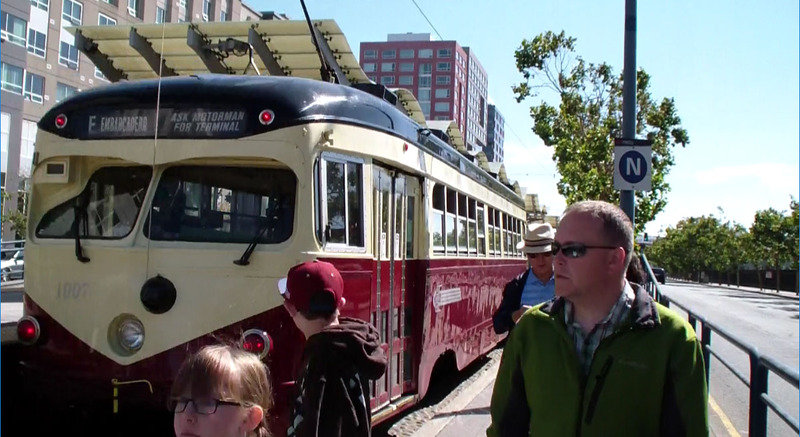 Clipper has recently expanded to Petaluma Transit, Sonoma County Transit, and the Petaluma City Bus. To find out more on how to use Clipper on these transit agencies, visit https://www.clippercard.com/ClipperWeb/index.do. It's been one whole year since we began our website out of our sheer love of public transportation, and we've come quite a ways - We began our YouTube channel shortly after the launch of our website, we created Transit Accessible Attractions, and we launched our very own app, with substantial amounts of publicity. We are going to continue the standard of excellence we held ourselves to one year ago, February 21st, as we begin our 2nd year bringing out the most up-to-date transit information we can provide. We will continue to grow our website and support every aspect of it, and we will continue to provide the reader with up-to-date information from anywhere in the Bay Area. So join us - we're going to help you navigate the complicated world of Bay Area Transit, no matter how large or small the issue is. "Wait, where's the exit," or, "Wait, where's the drop-off zone?" Are common questions for BART's riders, and it's certainly not their faults. BART has historically had awful signs that don't clearly point to the daily rider where to go. However, this is changing, finally, in the next couple of years. It's already begun in several places, where BART has been installing new entrances, signs and information displays (below) around the system. 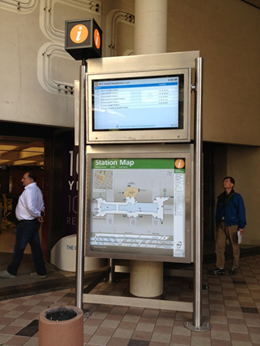 BART has also gotten to work installing real-time departure screens at entrances to stations - a hugely popular phenomenon. 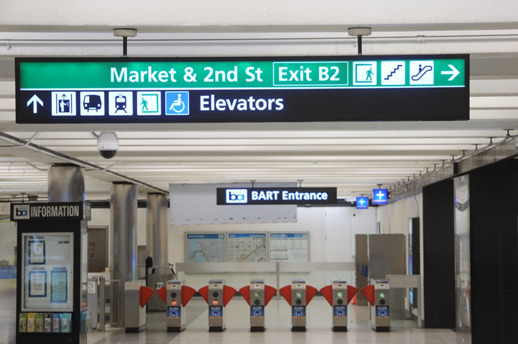 The BART Board of Directors approved a contract on January 28th to jump start the third phase of wayfinding projects at Lake Merritt, Coliseum, San Leandro, Bay Fair, Hayward, South Hayward, 19th Street/Oakland, West Oakland, 16th Street/Mission, and 24th Street/Mission stations. Construction is expected to begin in May 2016, and should conclude by the end of 2017. Finally, after 45 years, BART is actually receiving the proper signage it deserves. For more info, go to www.bart.gov.